Mike King, on-stage at TrustPower Arena, talking candidly to the Bay’s kiwifruit industry about his own mental health struggles. Photo: Jamie Troughton/Dscribe Media. Two-hundred people from the Bay of Plenty’s kiwifruit industry yesterday heard Mike King share his mental health challenges as well ways to deal with improving their own wellbeing and that of their friends and colleagues. The talk – ahead of the kiwifruit industry’s high-workload harvest and packing of fruit – was organised by the Future Leaders group as a timely reminder that high priority must be placed on people’s wellbeing. Future Leaders chairman Campbell Wood says the idea of the event, sponsored by NZKGI and Zespri, came from the importance of staff wellbeing in an industry that experiences high peaks of workloads during an intense time while harvesting and packing the fruit. “The topic is very real and brings a high risk to the industry, given the susceptibility and how vulnerable we are to factors such as environmental events such as hail, flooding, drought; pressure of resources with the harvest looming and the amount of labour that will be required; biosecurity risks; a standalone country requiring access to international markets; and financial returns. “I only name a few – and many fall into a category of being factors out of our control, putting immense pressure on all of us at different times of the season,” said Cameron, as he introduced Mike to the stage. What followed was an engaging journey where the audience laughed as much as they fell silent as Mike spoke candidly of his mental health journey and what factors influence our wellbeing. The former stand-up comedian-turned mental health campaigner also educated on how we can keep check not only on our own mental health but that of our friends and workmates. Key topics included explaining how each person has an inner critic at work – like an inner voice delivering destructive thoughts, which can affect every aspect of our lives. Mike talked of how we as humans are vulnerable and fear isolation, and so gain self-esteem by approval from others; and how drugs and alcohol are used by people who struggling with their mental wellbeing. Then he asked audience members who were feeling their life was going great to stand, while those feeling not so great to remain seated. And that’s where his biggest message lay. “Life is full of ups and downs and we need to accept this – everyone has crap days. “For those of you sitting down feeling ordinary – know that this moment will pass. For those of you standing up, feeling extraordinary, know that you could the feel same way as the people sitting down in six months’ time. “But while you feel extraordinary, give your extra to others,” said Mike, pointing to friends and workmates as being the perfect candidates someone can turn to during a difficult time. 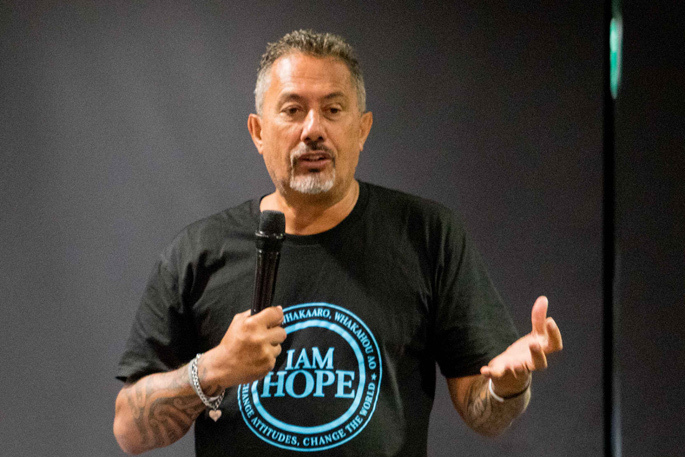 Lastly, Mike talked of the grey and white wristbands – with three words on them: ‘I AM HOPE’ – that he gives to NZ schoolkids to encourage them to open up about their struggles. The band signals to anyone in need that the wearer will help them. NZKGI chief executive Nikki Johnson said events such as Mike’s talk are a great reminder that a high priority must be placed on wellbeing for everyone in the kiwifruit industry. “Growers and others working on orchards as well as packhouses, including their families and neighbours, should recognise that there is always support available. The rural support trust can be contacted on 0800 787 254.